Meal planning and grocery shopping early this week is paying off already! If you saw my post on Sunday, you'll know that I have a lot of healthy options for snacks. I have been eating cherries, peaches and cantaloupe for snacks at work (along with my usual string cheese). It's day two of eating these fruity snacks, and I am already feeling better! All together, now: "Hail to the fruit!" While grocery shopping, I also picked up these new (to me) stick-on nail decals. The package said that they last for up to 10 days. I thought they were super cute, so I decided to try them. Surprisingly, they only lasted ONE day. I could have probably made them last longer but I type a lot (for work and for my blog). The decals started peeling off at the edges, which was a little annoying, so I peeled them off this morning. It may be nice for a special occasion, but if I get them again, I am not going to count on them lasting any more than a couple days. Last night we had summer for dinner. 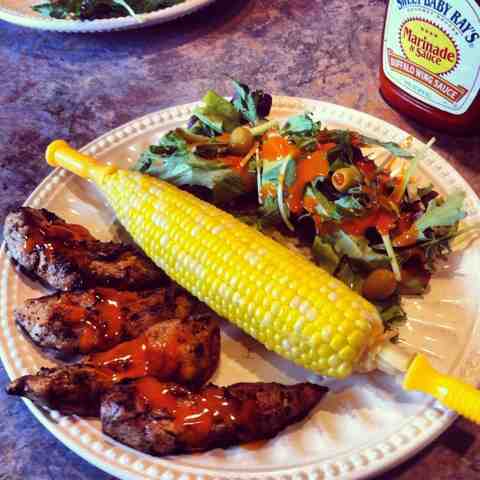 Sweet corn on the cob, grilled chicken and a side salad. It doesn't get much more summer than that! I actually forgot how good sweet corn on the cob tastes. I haven't had any since last summer. That's way too long! We are scheduled (according to our meal plan for the week) to have corn on the cob again on Friday. Just another reason why Friday is going to be awesome, aside from the usual last work day of the week business. The only issue I have run in to thus far is tracking my calories. It was hard to do while on my business trip last week. I did track my calories for most of the days, but not for all 5 out of 7 days, as I had hoped for. This is a fresh week, though, and I am tracking calories for today and finished yesterday under 1,800 calories. Tracking while eating out is tough to do; so for the remainder of June, I shouldn't have too much of a problem meeting this goal! Especially with my meal plans all set out for me! Today, I got a super exciting email asking me to review a product and host a GIVEAWAY! This is the first time I have been *asked* to host a giveaway. Prior giveaways were done by me personally. I am b e y o n d excited about this opportunity for both you and me. I love to review products and I know you love getting products for free. Stay tuned for more about the giveaway, I am responding to this email right now!